Charlie's younger sister, Sally, attends a different school in which there are no explicit behavioral expectations. Students are not taught what behaviors are expected of them at school. Unlike at her brother’s school, Sally's pro-social, positive behaviors are not recognized. There is no clear incentive or direct impact for following the rules, which are unclear to begin with. In both home and school settings, abundant research demonstrates that reactive, punitive and exclusionary methods of handling problem behaviors are ineffective at changing behavior and can have significant long-term negative impacts on children’s mental health and well-being. These methods are typically reactive rather than proactive, and problem behaviors often re-occur at higher rates and more intense levels. As problematic behaviors persist, school systems often increase their reactive responses, such as increasing surveillance and excluding students from school. These punitive responses, especially so-called zero tolerance policies, have been found to be ineffective in making schools safer. In addition, these policies tended to create oppressive environments with inequitable practices that predominantly impact students of color. As described by the National Center on Positive Behavioral Interventions and Supports, school-wide positive behavioral interventions and support is a whole-school approach to implementation of evidence-based positive behavioral interventions to improve organizational practices and create effective learning environments. SWPBIS is not a specific program, but rather a framework for putting into place procedures and systems that support the delivery of research-based effective interventions. SWPBIS aims to create positive environments by identifying common behavioral expectations that are valued by the school community. These expectations are universally applied to all students so they know what is expected of them at all times. Students in Tiers 2 and 3 are typically in need of more support which could include further teaching and practice of school rules, social skills groups, anger management groups or the design of an individualized behavior support plan. Additionally, parent involvement is a crucial aspect of supporting students in need of Tier 2 and Tier 3 interventions. At the Tier 1 level, SWPBIS practices typically involve identifying three to five positively worded behavioral expectations (for example, "be responsible, work hard, show respect") that encompass the values important to the school community. These behavioral expectations are then explicitly taught in all school settings; students are taught specific behaviors in order to “be responsible” in the classroom, hallways, cafeteria, playground and bus. The behavioral expectations are positively reinforced through praise and, often, a formal acknowledgement system. For example, any student may be eligible to receive a “ticket” or “slip” when a staff member recognizes that the student has clearly demonstrated one of the behavioral expectations. These acknowledgements can be sent home to be shared and reinforced by parents, and may make the student eligible to earn rewards, such as having lunch with the school psychologist or principal, selecting a prize or small token or earning extra recess time. Universal screening is used to identify students who may need small group Tier 2 interventions to prevent further problem behaviors from occurring. Ongoing support within Tier 2 includes a system for increasing structure and predictability, increasing contingent adult feedback, linking academic and behavioral performance, increasing home/school communication, progress monitoring and collection and use of data for decision-making. One example of this is "Check-in/Check-out," a prevention program for students who are beginning to engage in problem behavior. It operates by providing the students with more frequent feedback to prevent future problem behavior. Approximately 1 to 5 percent of students will require supports beyond the scope of Tier 1 or Tier 2 level interventions. These students are typically those who demonstrate significantly disruptive behavior problems or who have not responded to less intensive Tier 2 interventions. Tier 3 interventions are individualized to meet the specific needs of the student. Tier 3 supports also involve frequent data collection and progress monitoring to ensure interventions are effective for the student. This level of support typically involves first conducting a Functional Behavioral Assessment to determine the function of the student’s problem behavior and any skills that may need to be explicitly taught. The assessment includes identifying specific events surrounding the behaviors of concern. The FBA helps the school team better understand the antecedents and consequences that are likely maintaining the behaviors. Results of the FBA are typically used to help the team develop a positive behavior support plan for the student. The goal of the PBSP is to decrease the frequency, intensity and duration of the problematic behaviors, while also increasing positive behaviors. The PBSP includes instruction on desired replacement behaviors — which can serve the same function as problem behaviors, but in a more appropriate way — as well as rewards for displaying the desired behaviors and strategies for eliminating the problem behavior. Data are routinely collected about the student’s response to the PBSP to determine its effectiveness and make changes as needed. Research indicates that SWPBIS leads to decreases in problematic behavior, office disciplinary referrals, suspensions and expulsions. Additional benefits of SWPBIS include improved school climate, organizational health, teacher self-efficacy and increased time in instruction. Nationally, research is beginning to demonstrate a positive link between SWPBIS and academic success, and the model is increasingly being implemented by schools to focus not only on behavioral change but also academic improvement. Many schools, districts and states throughout the country have been implementing SWPBIS with favorable results. The U.S. Department of Education’s technical center for PBIS indicates that these methods are being implemented in more than 23,000 schools nationwide, and many schools in the commonwealth have been implementing SWPBIS since 2007. An effectiveness study of SWPBIS in Pennsylvania found favorable results on several overall outcomes, including staff member reporting fewer risk factors associated with problematic outcomes, such as school violence. They also reported higher protective factors, including resiliency, positive student expectations and safe school climates. In addition, the researchers noted declining trends in the suspension and expulsion rates in schools implementing SWPBIS. Results indicated a positive trend in state standardized math and reading assessment scores among the SWPBIS schools, and the higher the degree of fidelity of implementation, the better the academic outcomes. In many ways, implementation of SWPBIS is proving to be an effective approach for maximizing children’s development of academic, socia, and life skills. Dr. Jessica Dirsmith is a school psychologist for the State College Area School District and also teaches in the Penn State school psychology program. Dr. Sarah Rochette, a licensed psychologist, is a school psychologist for the SCASD and provides supervision in the Penn State CEDAR School Psychology Clinic and for doctoral-level school psychology interns. There were a lot of questions about the future of Beaver Stadium on Penn State's Coaches Caravan two weeks ago. And a few answers as well. 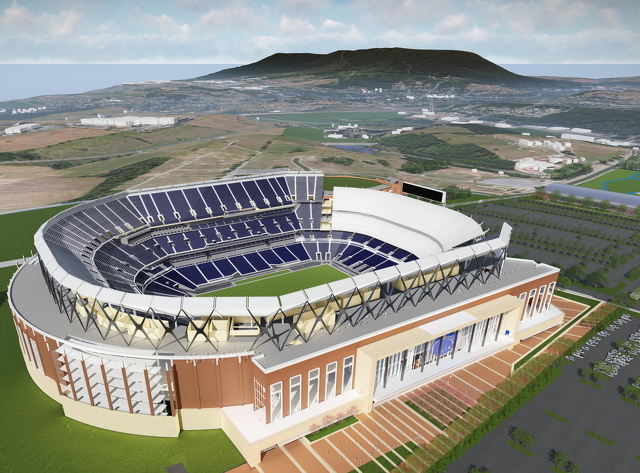 What emerged was a clearer picture of where Beaver Stadium fits in Penn State's Facilities Master Plan, released in March.